Are we all enjoying 2014? How about the two years prior to this? The political rollercoaster ride is enough to age anyone paying attention. We've all seen the globalist pull off one stunt after another in the last few years. Huge murder scenes without a single drop of blood, accused killers doped on TV so they can't defend themselves, staged scenes, crisis actors, politicians blabbing off propaganda attempting to get hasty results from the ordered false flags. We've seen the new world order and the globalist politicians become exponentially bolder. Crimes and lies have been committed by our President, Attorney General and former Secretary of State without any of these globalist politicians batting an eye. We've seen accused killers murdered in broad daylight; murders and their pacifying narratives coordinated between police and mainstream media while the masses are intoxicated with more and more entertainment to keep them asleep. We've seen scientific fraud and medical crimes before our very eyes while those committing these crimes actually do the threatening instead of being threatened. We've seen whistleblowers die mysteriously in strange accidents without police suspecting a thing. We've seen the silencing, marginalizing and intimidation of activists world wide. We've seen the spread of war throughout the middle east fitted to perfectly appease everything that Israel has wanted. The list goes on and on and we're just talking about the last two or three years alone. It's apparently not enough to catch government false flags and lies in real-time. We've seen counter government propaganda in response to being caught in real-time. We've seen Sheriffs go on TV just to threaten truth seekers shortly following one of their false flags. We even seen Dianne Feinstein introduce legislation to make alternative media illegal. Face it, the globalist have thrown the kitchen sink at the worldwide human consciousness movement also known as the truth movement and often broken into other segments such as the liberty movement, anarchism, freedom movement and more. As if all of these ongoing conflicts bestowed on humanity is not enough, in 2014 we have an even greater threat above and beyond all the usually spoken about problems and calamities. A problem few know how to address and many are naturally fearful of. Ebola seems to be the latest number one talked about topic on mainstream media. That would be the selected topic for the usual mainstream media 24/7 circus. B) Stories that they WANT you to think about. Remember 9/11? Do you think mainstream media covered 9/11 because they knew that what they were saying was 100% true? No. Media covered 9/11 24/7 round the clock because that is what they were TOLD to do. My point is that mainstream media only gives 24/7 attention to topics that they want you to focus on. Topics that will help accomplish their goal. From Ferguson to ISIS to Ebola, the control system has the psyche of America and the world where it wants it. Down the road no one will remember the botched MH17 false flag, the MH370 jumbo jet disappearance from the planet without a trace that the U.S. military confidently said could take "years" to find, the fully exposed CDC vaccine-autism connection. No one will even remember that for weeks Israel laughed at the world, concocted one propaganda story after another WHILE committing genocide in Gaza. Down the road, sadly the horrors humanity has seen will all be wiped away from many people's memories. But the question should be asked, why? 1. They only give the 24/7 red carpet to stories that generate FEAR. 2. They only give the 24/7 treatment to stories that help push the new world order plans forward. Remember when small human interest stories got the same treatment? I'm not sure I can remember that far back either but this was the case at one time. 3. They only give the 24/7 treatment to stories that not only generate fear (point one) but that specifically make you think that you will die. Now close your eyes and imagine a world where no one was afraid of death. In fact imagine a world where everyone welcomed death. Can you imagine this? What if most humans were not able to respond to fear. What if we only viewed the world through the eyes of those that are overwhelmed with the greatness of life, through the eyes of those who get it that death will occur some day but that think its cool to see how it will happen? Have you noticed that the suggestion of not fearing death leaves the globalist and those under the control system hypnosis in a blank state of mind or sometimes outright offended. That's because to remove the fear is to defuse the entire machine and its agenda! So as we see the "Ebola" scare ramp up to an all time high keep in mind that government and mainstream media only entertain stories that their intelligence sources has been working on. Remember that all of CIA's mainstream media are players in the Intel community's theater. Remember that control freaks know no end, there is no coincidence and nothing covered 24/7 is random. The globalist have stated clearly in the past that one must 'never let a crisis go to waste' and they absolutely believe this. 1. The globalist stated goals of depopulation clearly outlined in their Georgia Guidestones in Georgia. 2. The globalist politicians and U.S. government need to find an effective and "legal" way of rounding people up to designated locations against their will. Did you know that "Quarantine" is recognized by the U.S. government as one of the "legal" reasons for rounding people up? That's right. Government sees no constitutional or other issues in their way and thus a medical situation warranting a "legal" rounding up of civilians is quietly a masterpiece plan and a perfect tool for moving forward with long planned forced round up, FEMA camps, forced vaccination, easy "disappearances" of enemies and a lot more. Oh let me be clear, you will not be told you are going to a FEMA camp or prison, you will be instead taken to a "Quarantine Station". Given the long list of globalist crimes outlined earlier, most Americans are not even considering how the Ebola scare may be the mother-ship of all orchestrated events of the last few years. Let's face it, many events of the last few years did not quite accomplish what they wanted although the politician rhetoric on many of these topics have been ongoing. It also lends creative consideration for hidden reasons behind the ongoing chemtrails spraying of the last 10-14+ years. Will the mass population's inability to fight off Ebola be related to the years of chemical spraying their immune system with nano-sized metal particles like Aluminum, Barium and Strontium? Just a thought. This special virus scare which we've seen so many times in Hollywood movies prior to this, is a darling of a tool for the globalist criminals. It is therefore very likely that they have been planning for this for some time. That would explain why CDC has been caught lying about Ebola conditions for spread, why CDC has put out statements of intimidation against anyone who tries to share knowledge about alternative cures for Ebola, why president Obama is doing nothing to stop flights from Liberia and other parts of Africa from flying to the U.S., why patients diagnosed with Ebola are being allowed to board planes, and why CDC brought 2 patients to the U.S. instead of observing them in their own countries. At this point we can expect the oddities and suspicious government behavior to continue. After all, this is the same government which has been caught in so many other operations over the last few years so we should not expect anything different. So don't let the fear of your perdition get in the way of the simple patterns of truth right before us. Don't ignore easy truth for fear of being labeled "conspiracy theorists". Think about it, if people are dying all around you, is it possible to still be a conspiracy theorist? Is there no point of default victory for the conspiracy person? Is there no 'I told you so' moment? And if there is, what good is it to be right when people REALLY ARE dying from a deadly virus? 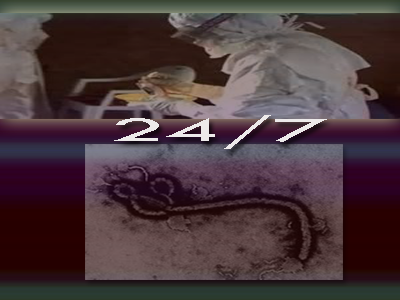 I believe Ebola is part of 2014 plans and very much part of the globalist long term plans for reasons stated above. Grab truth by the horns and learn to recognize their pattern. See the greater agenda at work here. Here's something to consider. Why not transport scores of Ebola patient straight into ISIS base camp? Would that neutralize the James Bond terror group that U.S, Israel, Turkey and allies help build? Wouldn't ISIS falling to Ebola ruin the globalist plans? Can you imagine this happening? Neither can I. Too much has been spent on the building up of ISIS to use as predictable pretext for war. The globalist are really tip toeing in their folly with Ebola. Keep your head up, turbo-boost your immune system, stay positive, watch the globalist every move and warn others. Whether Ebola can be contained or not (which I believe it can and will be), expect the globalist and their mouthpiece media to fully utilize the Ebola script to get everything they want, and this is the grand lesson in all of this. Welcome to the real world where the globalist plans are very real and they affect you and I directly. Use this moment to exercise ALL of your abilities and skills. Not only knowledge of how to boost your immune system but other survival skills. I believe a solid segment of humanity will rise which is completely resistant to Ebola. Doesn't it seem odd that CDC and government has put out zero information on how to boost your immune system? As with the many false flags of the past, try to see through their long term plans and bring your mind at ease. After all, knowing and understanding your surroundings and the battle field is an important part of fighting and overcoming. Now is the time to familiarize yourself with the surroundings of the enemy, the enemy's tactics, plans, strategies, and misleading information. Now is the time to error on the side of guessing it's all conspiracies and letting your instincts, knowledge, intuition, wisdom and understanding take over. It's time to turn off mainstream media news which is the exact opposite of all you need. Isn't it time to lay the mainstream media mouthpiece distraction down and give yourself a fighting chance to survive? In every fighting moment, and every challenge you personally face in your journey, mainstream media and government will not be there for you so why give them so much of your personal attention. That is why lately I've been calling for others (for the first time) to let go of mainstream media propaganda because your life (literally) now depends on it. That's right, now more than ever it is vital to awaken to the new world order plans... or die. Given this new option perhaps Ebola (like ISIS) will play a central role in the greater mass awakening humanity has been waiting for. When the greater (and perhaps still gradual to many) awakening does happen, ask yourself, will you be there to witness the change humanity is headed toward? Will you play a role in waking others up? Or will you whither away and succumb to a virus or other attack never having had a chance to share this information? Now more than ever is the perfect time to make that choice.